Genota, Lauraine. “Majority of District Leaders Concerned About Cyber Threats, Project Tomorrow Report Finds.” Education Week. 28 November 2018. As schools increasingly turn to education technology and cloud computing, they become more vulnerable to hackings. 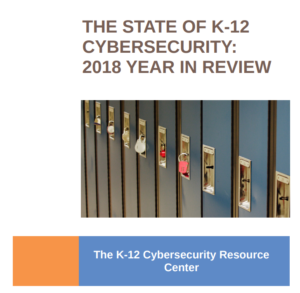 There have been more than 380 cybersecurity-related incidents involving U.S. public schools since 2016, according to Levin. The Project Tomorrow report shows that cybersecurity is an issue that still hasn’t been solved, Levin said. Schools need more resources, including money devoted to solving the issue as well as expertise. Levin said schools have very few experienced IT staff members and often have difficulty retaining those who are in the educational system. Schools also tend to have older equipment, which are more vulnerable to attacks. Perhaps just as important as hardware and software that guards against malicious attacks is raising awareness about them and providing training to staff, students, and parents, Levin said. “All it takes is one person to click on a link to bring the whole place down,” he said.